I couldn’t wait to see Chelsea’s wedding pictures. With all the talk about the cost of this wedding, I was sure it was going to be a elegant affair. 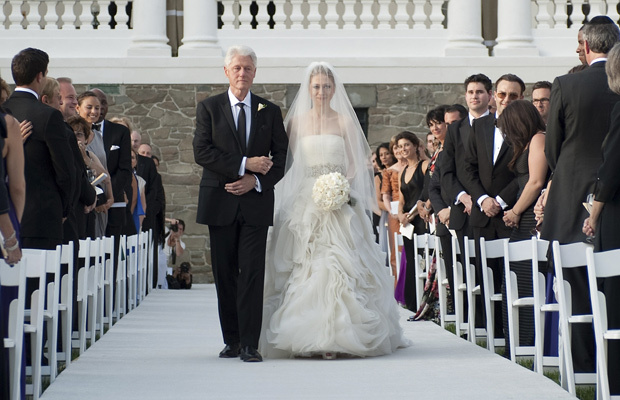 Chelsea Clinton wore a white Vera Wang wedding dress to exchange vows in from of 400-500 guests, including Vera Wang herself. The strapless Vera Wang dress featured a diagonally draped bodice, ballgown skirt made out of raw edged laser-cut swirling silk organza, and a train in silk tulle. 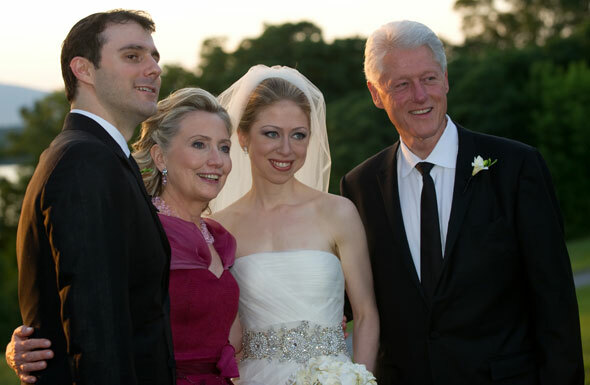 Marc Mezvinsky wore a handsome black suit. Mother of the bride, looked beautiful in an elegant raspberry-hued dress with puffy shoulders and a tied waist by Oscar de la Renta. Bill Clinton wore a slim black suit and narrow tie.